Marvellous ground floor apartment in a quiet residential with garden and swimming pool 50 m from the fine sand of Las Marinas Beach and 9 km from the centre of Denia.This property offers 128 m² well distributed between 3 double bedrooms with fitted wardrobes, 2 bathrooms, fully equipped kitchen and the luminous living room of 55 m² with fireplace. We can also enjoy 27 m² of terraces. One of which is glazed and used as the dining room.The master bedroom is spacious, dressing room, bathroom with bathtub, a bathroom with shower, air conditioning, ceiling fans. Housing finishes are of first quality (lacquered white doors, PVC Windows with double glazing...).The residential complex has a large garden and swimming pool. The property is completed with a parking in front of the door of the dwelling place. An ideal option to enjoy throughout the year on the Costa Blanca, a step away from the sea and the mountains.Next to the house are located several restaurants with terraces on the beach, a shopping centre only 1 km away, gym club, pool cover, stop bus, surf school and all the necessary services. Apartment in Denia golf resort, next to the Denia Hotel & Spa, the 27 hole La Sella golf course and the natural park Montgó, just 5 kms from Denia and the beach. The main suite comprises a superb kitchen, fully equipped with crockery and cutlery, which is integrated in the dining/living area. A stunning master bedroom featuring a hydro massage bath tub and vanity unit. Adjacent lies an independent bath with built-in shower, accessable from the hall. A double door connects with the guest suite. It´s distributed in an ample bedroom, sitting area with balcony, separate bathroom and kitchenette. Apartments are clustered around a modern and spacious swimming pool and a glorious whirlpool embedded in a magnificient garden. The pool area offers sunbeds to relax on, dressing rooms, showers and lavatories. Each apartment has an allocated exterior parking place. Full services including housekeeping, maintenance and reception. The property is fully furnished and equipped to the standards of a 5* hotel. 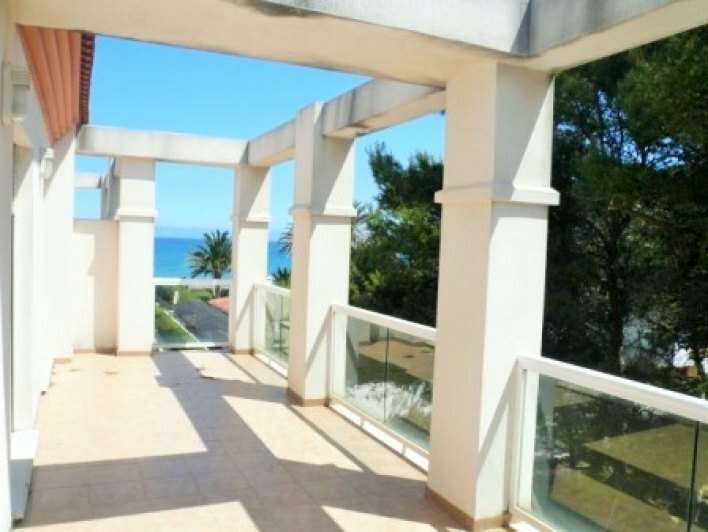 Apartment on first line beach with fantastic views to the sea in one of the best areas of Denia.Featuring 3 bedrooms, all exterior, 2 bathrooms, spacious living dining room, closed kitchen with laundry area and large corner terrace. 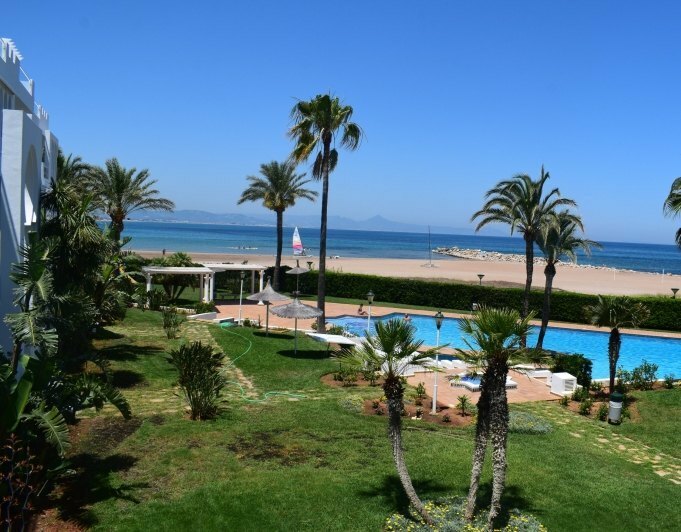 Airconditioning cold/hot throughout the apartment, garage and large storage room.The complex has swimming pool facing the sea, green areas and direct access to the sandy beach. 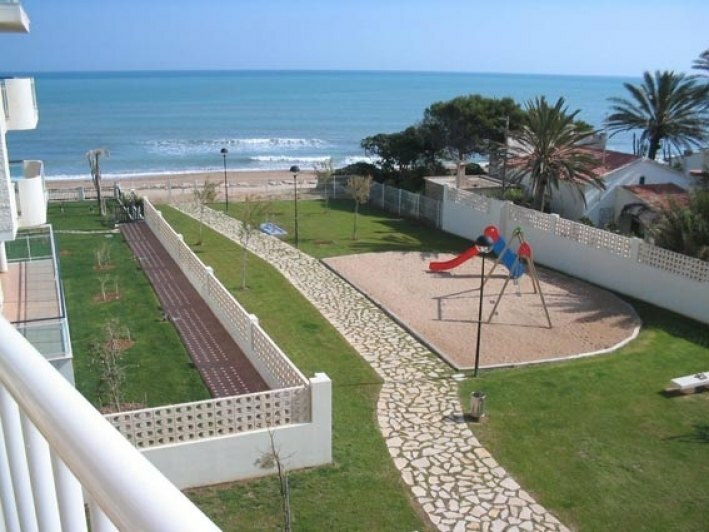 Apartment for sale in Denia. Sea front, sandy beach, Totally renovated. (waiting for new photos) luxury urbanization just a 5 minute walk to restaurants, supermarkets, drugstore and a very short drive to Denia town. ibi tax 350 anual. Fee 380 every 3 months.